We make patient experience the backbone of your practice through reviews and patient feedback. Cutting Edge Medical Practice Review Platform is a patient experience and online review engine that enables insights, empowers marketing and converts patients. Gather patient feedback and reviews into one place to boost your practice. We know local SEO better than anyone. 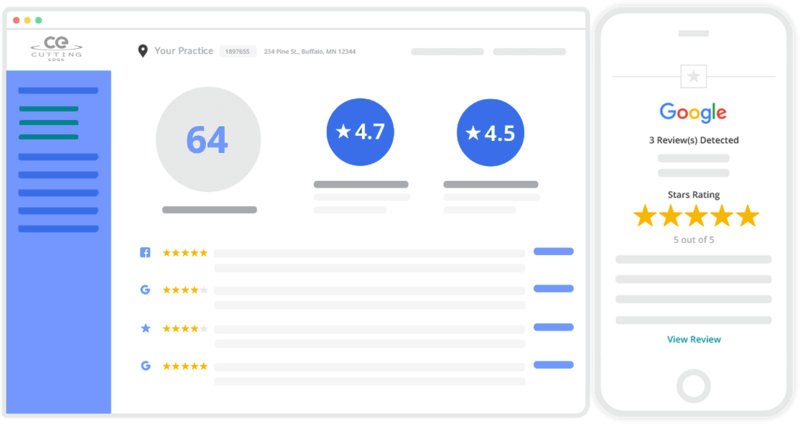 More reviews and better ratings help you harness the power of 3rd party online review sites to improve your website’s visibility and ranking in search. With multiple ways to add 1st and 3rd party reviews to your website, you can use Cutting Edge to turn your site into a sales funnel. Gain Testimonials: Positive feedback can display on your website automatically. Easily Request Feedback: Email a request, hand patients an iPad in your office or simply refer patients to your website. Encourage Reviews: After positive feedback is submitted encourage reviews at Google, Facebook, Realself and more. Cutting Edge Practice Review is an automated platform that starts with just your patient’s email address or mobile number and does the rest for you. You can also use kiosk mode and pass an iPad to a patient in your office. 72% of patients say their first step in finding a new doctor is checking online reviews. Cutting Edge packs dozens of customizable features into one solution to easily acquire patient feedback and online reviews. Simple, robust & complete feedback platform for your medical practice. All of our features are responsive for a complete mobile-friendly experience. 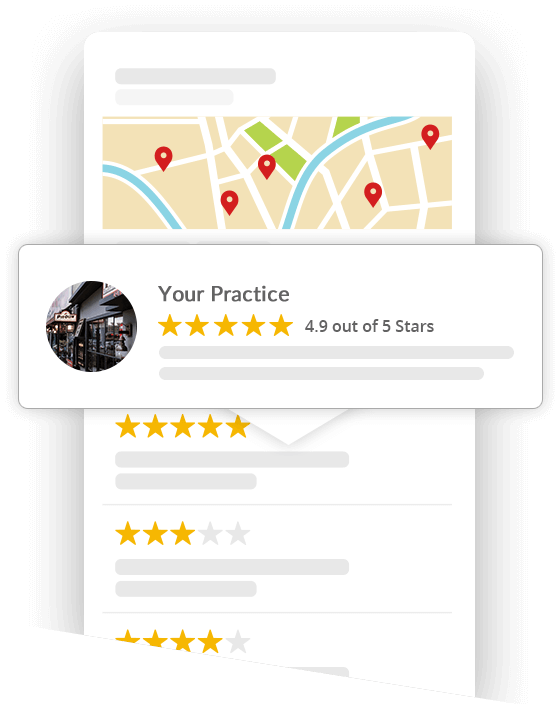 Our platform can manage feedback for one practice location or dozens. Use our API to automate and integrate our offering from start to reporting. Review Signals (Review quantity, review velocity, review diversity, etc.) make up 15.44% of Google’s ranking factors for local map results. Online reviews are more important than ever for boosting your practice. Cutting Edge offers multiple methods to acquire your patients feedback and information. Employ one or multiple methods to achieve the best results. Manually add one patient email at a time or upload a spreadsheet. Use your tablet or iPad to capture your patients feedback and information onsite. Integrate our API into your CRM or database to fully automate the process. Cutting Edge brings multiple levels of feedback from your patients into our platform allowing you to gather, evaluate, measure and market your patient’s experiences. Capture your Net Promoter Score, a powerful data point and indicator of your patients experience. We help you capture powerful testimonials from your patients that you can use in your marketing. Embed the widget anywhere on your own website to automatically display positive testimonials. We encourage happy patients to review you online at the review sites you select. Choose from over 100 review sites. Cutting Edge offers feedback notifications, review monitoring and platform reporting to help you analyze your patient feedback and online reputation. We benchmark your Net Promoter Score over time so you can evaluate your improvement and patient service. Receive email alerts when patients rate you low so you can follow-up to and head off negative online reviews. Cutting Edge is intuitive and robust with features. Gain efficiency by managing your patient feedback and online reviews all in one place. See results as you capture, monitor, and grow your reputation along with your practice. Add patients in just seconds or even automatically to request feedback and reviews with ease. Our system handles the requests, reminders, personalized content and more to engage your customers. We save you time! Our emails and messaging are customized with your brand, logo and accent color to have you looking great. Receive notifications for new feedback, reviews and more. Respond right from our system for easy communication. Use our Review Widget, Conversion Pop-up and social features to market your great reviews and improve your SEO. Let’s win your next patient. Get the data and insight you need to manage, make changes and track progress of your reputation, reviews and Net Promoter Score. Cutting Edge will make patient experience the backbone of your practice, building a continuous cycle of happy patients and powerful reviews to help you capture your next patient.